Over the years we have seen some fine anglers from the area hitting the headlines on the local match fishing scene and some have also gone on to test their skills at a much higher level. The late, great Robin Harris was a pioneer in his heyday, at times unbeatable on the River Nene, and in fact he became World Champion. Now though we have a different type of fishing on commercial waters that has seen younger anglers flourish. Recently John Whincup won a major fishing festival in Cornwall against some of the best anglers in the country. Last year city rod Steve Freeman and Josh Pace made it through to the £50,000 Fish ‘O’ Mania final and this season we have yet another representative. 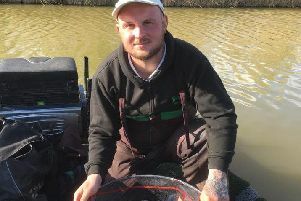 Dale Stones is through to the grand final after putting in a fine performance over at Barford Lakes in Norfolk topping the field with 91lb 14oz. In fact he has had a taste of the big time before, reaching the final in 2007, coming 7th on the day at Hayfield Fishery in Yorkshire. Dale is not what you would call a youngster, but like many others has made the switch over to commercial waters in the last few years. Cold conditions put paid to any high hopes of big weights at this latest Fish ‘O’ Mania qualifying round. Weights were well down and eight 10 peg sections were won with less than 50lb. Lets take nothing away from Dale though he fished a great match with a very positive approach from peg 31 on Willow Lake where he fished cat meat short to land carp to 10lb to see him take his place at Cudmore Fishery in July. This year there is a change of format to the final as he will have to win through a small but very competitive match the day before at the venue where the top 16 fish off for the huge jackpot, but I am confident we will see him in the final. One young rod who continues to show tremendous promise is Tom Edwards and at the weekend he put two fine wins onto his already impressive angling CV. On Saturday he had a peg to peg battle with Lee Marlow over at Rookery Waters, just getting the nod at the scales by a few ounces. It didn’t go his way at the start of the match as he broke his pole and fished the remainder of the match short fishing paste to finish on 125lb 10oz. Runner up was Lee Marlow with 124lb 14oz followed by Ben Townsend on 106lb 8oz. His form continued on Sunday when he fished the Decoy Lakes open on the Oak Pool. The match saw very impressive weights but Tom caught well right from the off on the pole fishing the margins to put a huge 235lb 7oz to the scales. In second place was Whittlesey rod Simon Godfrey on 231lb 6oz all taken on maggot from the margins, followed by Andy King who caught on sweetcorn for 211lb 2oz.